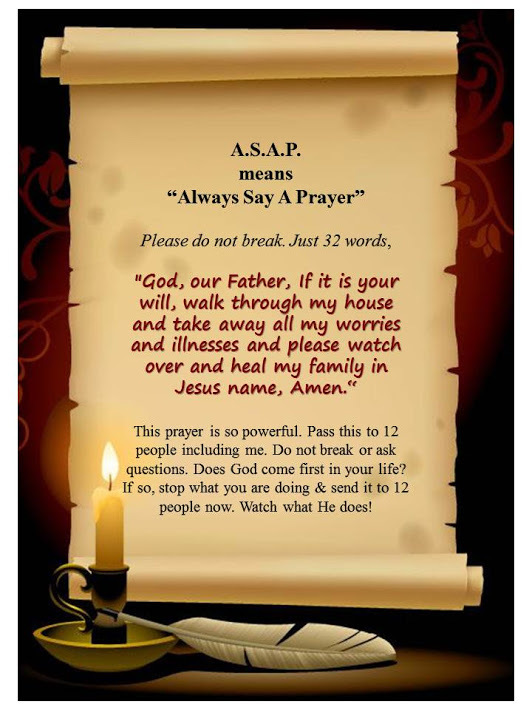 No, this prayer is not “so powerful!” God is powerful! And he’s not obligated to bless you if you send this to 12 other people! God doesn’t operate a multi-level blessing scheme! No, you don’t have to invite God to “walk” through your house—if it’s his will. God is everywhere! Even in public schools that some of these meme writers think his omnipresence can’t fill. His “will” is to live inside of you and fill you with his Spirit—not make a visit to your house! Yes, I will pray that Facebook users grasp a greater view of God power and majesty than these posts proclaim. A much wider understanding of what truly pleases God. And a love that goes beyond whether or not we forward these memes. And may you have the power to understand, as all God’s people should, how wide, how long, how high, and how deep his love is. May you experience the love of Christ, though it is too great to understand fully. Then you will be made complete with all the fullness of life and power that comes from God (Ephesians 3). • Is prayer in public school really a good idea? !